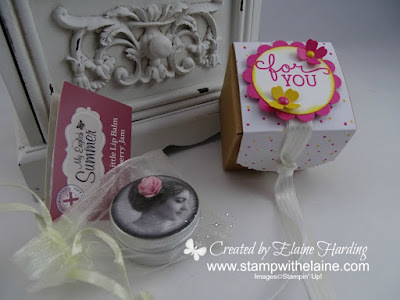 Originally, I was going to make a box to house these hand-made soaps and lip balm when I discovered that they fitted perfectly in Stampin' Up! 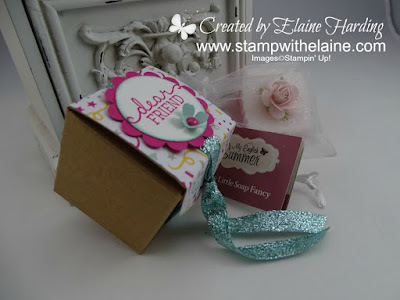 's Tiny Treat Boxes! I received a beautiful wedding favour from the lovely Danni who lives in Germany and her wedding favour inspired these. 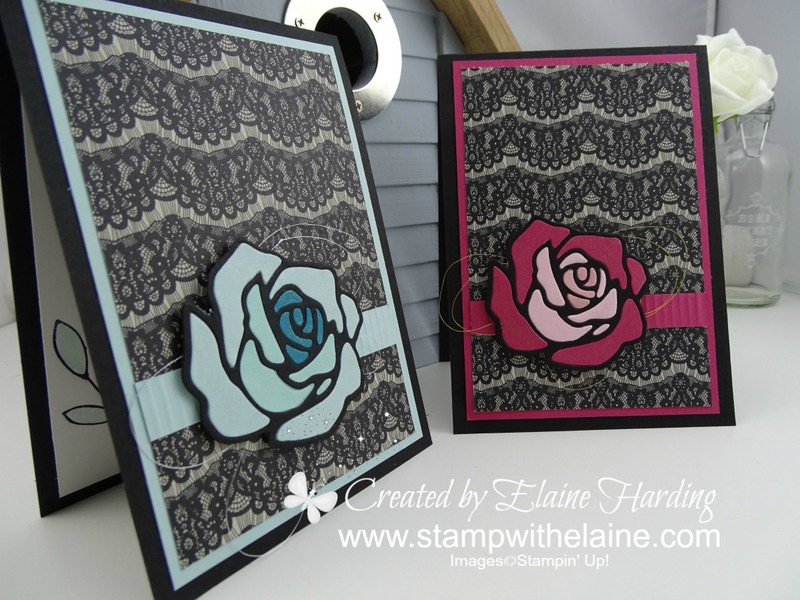 You've probably heard me mention that I was going to attend Stampin' Up! 's OnStage Live event in Salt Lake City this year. It was a wonderful opportunity to meet with a couple of Demos I met last year at the Brussels event and to pick up where we left off. I wanted to take them a little gift, not just a swap card, and I wanted something quintessentially English, other than tea! Then I found these beautifully packaged lip balms in a tin - the lid sported a sepia photo of lady with beautiful hair scooped up into a bun and nestled in that bun was a sculpted rose. The English Rose, I thought - seemed appropriate to take a "slice" of England to them! I feel a bit guilty I haven't been able to share sneak peeks at time of writing, because I have no information to hand - I have yet to attend OnStage, and yes, this has been written 5 weeks in advance! It wouldn't surprise me if there's been a compulsory blackout temporarily, but I will post sneak peeks as soon as I get the all clear! My thanks goes to Dena Rekow for the inspirational technique and especially for introducing me to Glad's press n' seal! I've not seen it at the supermarkets and sourced it from Amazon and just love it especially for this technique! I've deliberately left the sentiment out so I can add it later depending on what occasion I need it for! I shared this with my club ladies in May's class. The loved it and found it quite therapeutic. Enjoy! Big News! Be the Star! Biscotti in a Matchbox - Yum! !